Dr. Chao's current research interests focus on clinical trials and translational studies. The clinical trials he involves are about the development of new drugs or strategies in treating cancers and hematological disorders. In translational studies, his major effort is on the development of a novel biochemical marker, i.e. tartrate-resistant acid phosphatase 5b, in the diagnosis and monitoring of metastatic bone disease of breast cancer. He also intends to define the role and search the potential usefulness of tartrate-resistant acid phosphatase 5a in macrophage-related disorders. Dr. Chao began his career in cancer research at Roswell Park Memorial Institute, Buffalo, New York. Subsequently he developed a productive program in the Tri-Service General Hospital using imprint cytology, immunocytochemistry and in situ hybridization for cancer diagnosis as well as immunotherapy for treatment. He has also participated clinical trials involving new drugs on the treatment of various cancers. Additionally, he has cooperated well with Professor Lung Tam Yam and Dr. Anthony Janckilla of the University of Louisville, Kentucky, USA, on the study of tartrate-resistant acid phosphatase (TRACP). 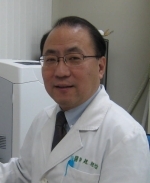 Dr. Chao has established the TRACP5a and -5b immunoassays and other related assays in his laboratories. He and his associates demonstrated that the serum TRACP5b activities in Chinese women were not different from those of the Western people. They also found that the serum TRACP5b activity was elevated in the serum of breast cancer patients with bone metastasis but not in those patients without bone metastasis, and the serum TRACP5b activity increased in those patients with extensive bone metastasis only. They found the serum TRACP5b activity may become a good marker for the diagnosis and following up of metastatic bone lesions in those breast cancer patients with extensive bone metastasis. Besides, Dr. Chao and Dr. Janckila have developed a new immunoassay for serum TRACP5a activity and examined the value in normal subjects and found TRACP5a is potentially an inflammatory biomarker in the future. Teacher of the year, NationalDefenseUniversity, September 2005. Outstanding Military Physician honored by the Ministry of Defense, Taiwan, 2003. Remarkable physician of Tri-ServiceGeneralHospital, 2001. Scholarship of Biomedical Science for physicianawarded by Academia Sinica, Taiwan, R.O.C., 1994-1995. Chao TY, Lee SH, Chen MM, Neustadt DH, Chaudhry UA, Yam LT and Janckila AJ. Development of immunoassays for serum tartrate-resistant acid phosphatase isoform 5a. Clinica Chimica Acta, 359:132-140, 2005. Chen CJ, Chao TY, Janckila AJ, Cheng SN and Chu DM. Evaluation of the activity of tartrate-resistant acid phosphatase isoforms 5b in normal Chinese children � a novel marker for bone growth. Journal of Pediatric Endocrinology and Metabolism, 18:55-62, 2005. Chu P, Chao TY, Lin YF, Janckila AJ and Yam LT. Correlation between histomorphometric parameters of bone resorption and serum type 5b tartrate-resistant acid phosphatase in uremic patients on maintenance hemodialysis.American Journal of Kidney Diseases, 41:1052-1059, 2003.